The Bath and body works vanilla bean noel moisturizing hand soap was great for everyday use. The smell was not too good. The soap was great for the Christmas and the holiday season because of its name and label. However, it was given as a Christmas gift and shortly after the holiday season the packaging just wasn't going to work anymore. Effectiveness The Bath and body works vanilla bean noel hand soap worked great in the bathroom it cleaned and moisturized mine and my family's hands. The soap did make my skin feel a little bit tight after washing my hands with the soap. Scent The scent of Bath and Body Works vanilla bean noel hand soap in my opinion was not very good at all. The scent of the Bath and Body Works product smelled nothing like vanilla. The smell greatly let me down in the way that bath and body works advertises for their scents and smells. It wasn't really a bad scent, but just wasn't the typical vanilla scent. Not only is this product in one of my favorite fragrances, it actually does really well at moisturizing your hands. I suffer from the worst dry and cracked hands, especially during the dry winter months. My hand crack from being so very dry. This product has improved this condition greatly. I like that it thicker textured soap that actually caresses the hands as you wash them. Leaving them soft and smooth. Effectiveness I am pleased with the way it has improved the condition of my hands. They are now very soft and smooth and not irritated as they were before. I love that this product does not dry my skin out and make my previous issues with dry, chafed skin worst than it was before I started using. This product is a plus in my book. Scent I love vanilla anything, so naturally i was drawn to this product. It smells heavenly and it is a rich smelling vanilla that lingers for awhile on the hands after washing. My favorite product from B&BW! I cannot stress enough how incredible the scent of this product is! It is my favorite scent Bath & Body works has ever released. I always stock up on the moisturizing cream when the holiday season comes by, and I also make sure to stock up on these moisturizing hand soaps for myself and friends! The scent is heavenly; it smells like marshmallows with a hint of vanilla. Since I can only buy this product during the holidays, whenever I use it now, It takes me back to the holidays which I love as it is my favorite time of the year! The hand soap is gentle on your skin and works wonderfully. The scent on your hand will last you a very long time as well, so there is no need to apply the lotion afterwards. I think this is a great product, maybe the best scent Bath & Body Works has ever had, so make sure to check it out during the holiday season! I usually buy several of them to give away in baskets for my friends or secret Santa giveaways! I love Bath and Body Works products. They all smell so good! This is the perfect scent for the holidays. It smells like cookies and candy and warm vanilla that reminds of the holidays. My hands always smell so good after washing with this soap and the whole bathroom smells like vanilla. The scent lasts a long time on my hands so they smell good for hours after washing! I like that the soap is antibacterial. This soap does a good job cleansing my hands without drying them out too much. I only use this scent around the holidays, but have many other Bath and Body Works soaps, lotions, and hand sanitizers that I use at other times of the year. Effectiveness I like the antibacterial soap and I love this scent around the holidays. Scent The scent reminds me of the holidays. I keep this hand soap in our bathroom to use between Thanksgiving and Christmas. It makes the whole bathroom smell like vanilla cookies. Excellent Soap & a Yummy Scent! Bath and Body Works is my go-to brand for hand soap, especially around any sort of special occasion or holiday, because they always come up with the fanciest bottles, labels, and special fragrances for each occasion. Spiced Cider for Halloween/Fall, floral scents for spring, citrus for summer, etc. And of all the occasions to buy special soap, Christmas is by far my favorite! Vanilla Bean Noel is just one of the many amazing scents that Bath and Body Works puts out at holiday time in not only soap form, but candles, lotions, etc. I am a huge lover of their soaps, and always stock up when they go on sale. Vanilla Bean noel is a rich vanilla flavor that really just reminds me of the holidays. It's warm, cozy and makes my hands feel silky smooth. The moisturizing soap helps keep the winter dryness at bay and prevent the cracks and redness that I am so prone to, and overall, this is just an excellent soap. Obsessed with Vanilla bean handsoap!! I have to give this hand soap a high 10! I am obsessed with bath and body works hand soaps and the vanilla bean noel scent is my all time favorite holiday scent. 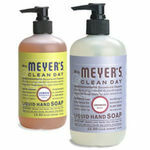 This hand soap is wonderful, it smells great, kills germs and moisturizes your hands. My only complaint is the little pump, when you use the hand soap it leaves some behind and then it adds build up around the hole making it difficult to come out. Other than that I have no complaints with the actual product. I love the fact that they come out with this scent around the holidays, in my opinion, this scent reminds me of the Christmas sugar cookies my grandma makes! It is just perfect! 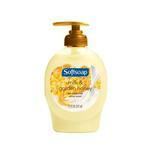 This hand soap does not disappoint, I highly recommend this for anyone, at any age. It is a wonderful addition to your kitchen or bathroom. Effectiveness This hand soap works very effectively, you get all the moisturizer of a hand lotion as well as the germ fighting power of soap. It works very well in the winter on extremely dry hands without the painful burning on your skin. Scent The scent is amazing, when you use this it will make you think of Christmas sugar cookies! It's perfect for the holidays and the scent actually lasts on your hands. It smells delicious, making you want to wash your hands more often. Definitely stock up around the holidays! This special Christmas themed hand soap should be available all throughout the year! The smell is absolutely incredible and I love it! Putting you in the holiday spirit is something that it certainly does. Follow up with a B&B Vanilla Bean lotion and your skin will smell good enough to eat! I use this soap on my hands and as the name suggests it does add moisture to them, and after each use my hands feel soft rather than dried out and icky. It is gentle and effective, and produces a great lather, something that is always important to me no matter the product I am using. Overall I would highly recommend this product for anyone who wants a nice hand soap sitting on the sink or in the guest bathroom . The smell is addictive and it leaves the hands soft, clean and moisturized! Effectiveness Cleans the skin as it is intended Scent A top choice when you love to smell good. this Vanilla Bean scent is truly terrific! 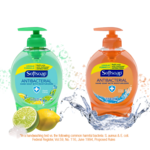 My family and I all have used this hand soap and we love it! After you use it your hands and the bathroom will smell really good! This soap is nice and thick going on and feels good on your hands. After you wash the hand soap off your hands will feel great and soft. I really liked the way this soap went on and washed off. It's really a great hand soap, especially with the added moisturizer. When I first put this in the bathroom each family member came to me and told me that they liked the new soap. I would definitely buy this again. Other hand soaps can dry your hands out, but this one doesn't do that. I was happy that I got this item and would buy again. Effectiveness It is very effective in cleaning your hand. It also does great at moisturizing your hand and making them feel soft and smooth afterward. Scent The scent is incredible and makes your hands and the room smell great. It may make you crave sugar cookies though. It smells so good! I could go on and on about this. I love Bath & Body Works. End of story. 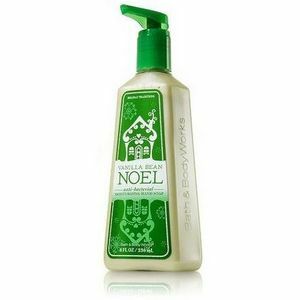 Vanilla Bean Noel Moisturizing Hand Soap from Bath & Body Works is lovely. I got the product on sale right after Christmas and used it the proceeding holiday season. One thing that makes this soap a little less useful than other scents of the moisturizing hand soap family is the packaging. It is definitely a Christmas-y, holiday inspired soap. The scent is somewhat similar to Brown Sugar & Vanilla. Also I feel like the color of the soap doesn't match the scent but I get it. It's green because it is a holiday themed soap. Bath & Body Works' Moisturizing Soap family is great for dry hands. The soap is thick and a little goes a long ways. The scent lingers nicely and leaves my hands feeling smooth which is why it's one of my all time favorites. I highly recommend this soap. While this particular scent is not high on my favorites list, this style of soap from Bath & Body Works is. Oh my goodness I am seriously in love with this limited edition hand soap from Bath and Body Works. I am an avid shopper of their products and am constantly eager to try anything and everything that I can from there. During the christmas season I went into my nearby Bath and Body Works to see all the limited edition selections. I tried out all the different soaps and fragrances and was extremely happy and soothed by the Noel Vanilla Bean collection. I loved the soap especially because I hate typical boring smelling soaps. This cute bottle had everything I was looking for and more. I personally love the smell and so do all of my visitors at my home. I even loved it so much I decided to bring another bottle to my work for me and all of my co-workers to enjoy. They were converted instantly to my favorite soap. The only bummer is that I can only get it once a year so I definitely have to stock up if I plan to have it for more than a couple months in the winter time.